Why does Ulster Bank charge Irish customers much higher mortgage rates than those in NI? The bank’s boss has been accused of “screwing” customers to pay for its bad decisions. ULSTER BANK’S BOSS says the company’s high mortgage interest rates in the Republic are charged because it costs more to run its business here than in the north. The standard variable rate Ireland’s third-biggest bank charges its customers here is 4.5% – significantly higher than the 4% rate for homebuyers in Northern Ireland. The company also has the largest interest margin of 2.32% of any major bank in Ireland. That amount, which reflects how much the bank takes away in profit from its loan book, comes despite 60% of its loans being low-margin tracker mortgages in which the interest rate is tied directly to the European Central Bank’s official figure. But its chief executive Jim Brown told an Oireachtas Finance Committee hearing he thought all banks should be making more money on their loans. “I think the margin that all banks charge … needs to improve,” he said. Why the different rates, Jim? Brown said the reason it charged higher mortgage rates in the Republic was because it cost extra to finance loans here and the company was taking more deposits in Northern Ireland. “The standard variable rate that we charge in Northern Ireland reflects the market and our cost of funds and our cost to operate in that market,” he said. Brown said the amount it paid for deposits in Northern Ireland was about half what it cost the bank in the Republic. 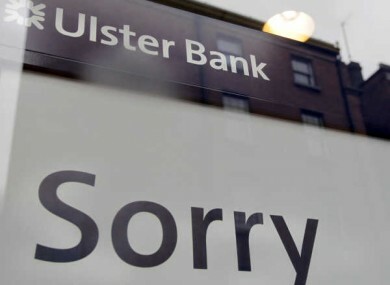 Ulster Bank currently holds about €25 billion in customer deposits and has €28 billion issued in loans. But Labour senator Aideen Hayden accused Ulster Bank of using loyal customers and new mortgagees to prop up its big tracker portfolio. “There is a perception out there … that you are basically making your variable rate customers pay for the extended tracker mortgages which you handed out when times were good,” she said. From their point of view, you hold money from ordinary folk – their salaries and so forth – in their current accounts, on which you’re paying them no interest to the best of my knowledge, your bad debts are reducing and your cost of funds is falling. Email “Why does Ulster Bank charge Irish customers much higher mortgage rates than those in NI?”. Feedback on “Why does Ulster Bank charge Irish customers much higher mortgage rates than those in NI?”.